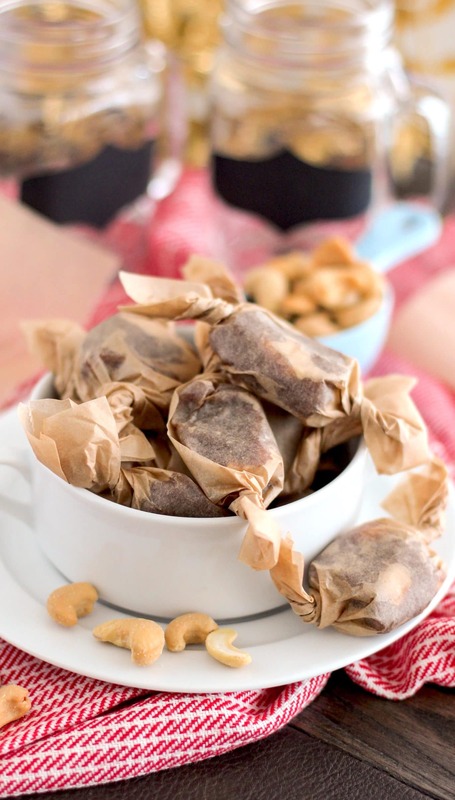 Decadent Chewy Cashew Caramels — seriously sweet, rich, and delicious, you’d never know they’re made without the heavy cream, butter, white sugar and corn syrup! Refined sugar free, dairy free, and vegan caramels? Ohhhh yes. A yummy bowl full of Cashew Caramels for family and friends to share. 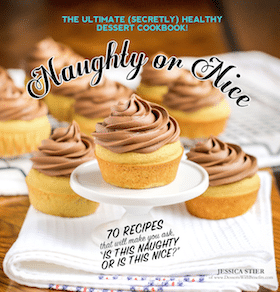 I recently perfected the most PERFECT Chewy Caramel recipe for my newly released dessert cookbook, Naughty or Nice. 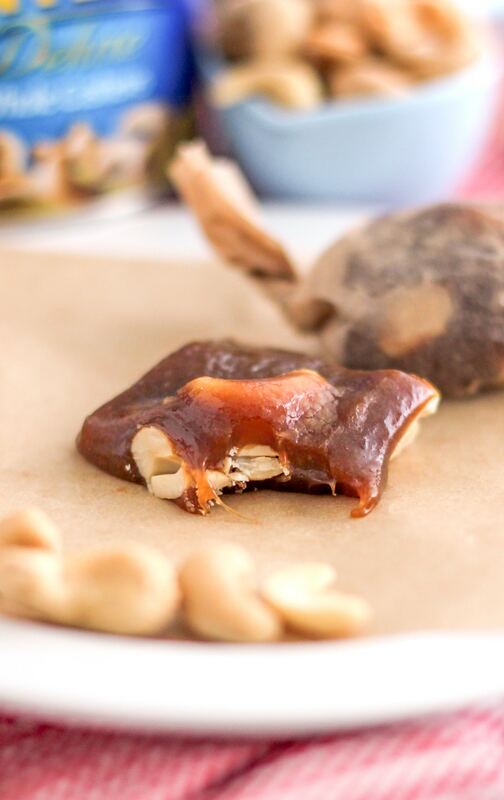 These Decadent Chewy Cashew Caramels are good. Okay, that’s better (and no, I’m not being dramatic). 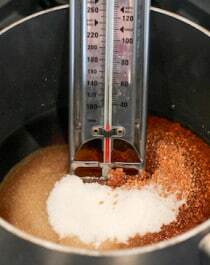 They’re life-changing because, if you’re like me and somewhat obsessed with caramel and its burnt brown sugary flavor (like how people obsess over those Pumpkin Spice Lattes), then this recipe will save you from a ton of excess calories and sugar. Not to mention, that dreaded sugar-rush and sugar-crash rollercoaster. 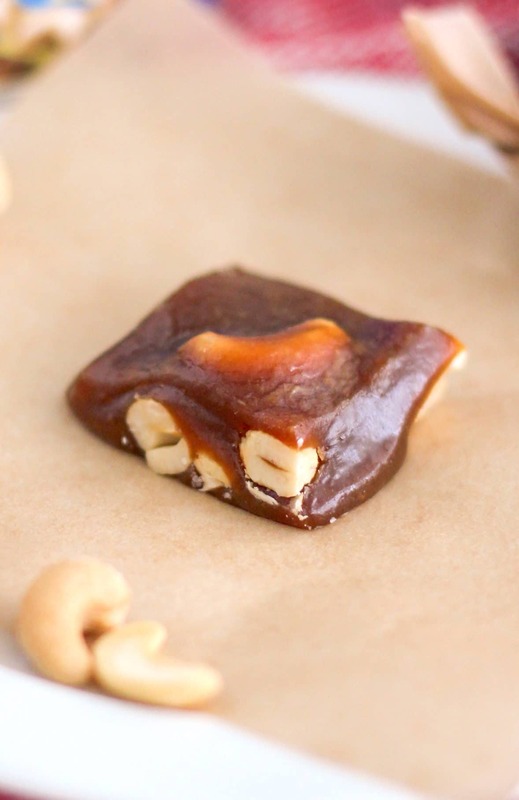 To help celebrate my book launch, as well as my serious liking passionate love for the Caramel-Cashew combo (it’s mah jam), I wanted to share this Decadent Chewy Cashew Caramel recipe with you. 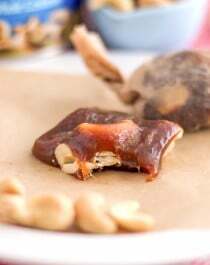 This recipe is slightly adapted from the Homemade Chewy Caramels recipe from the Naughty or Nice Cookbook. I just swapped crunchy, buttery, whole cashews in place of a super TOP SECRET ingredient (hehehe). 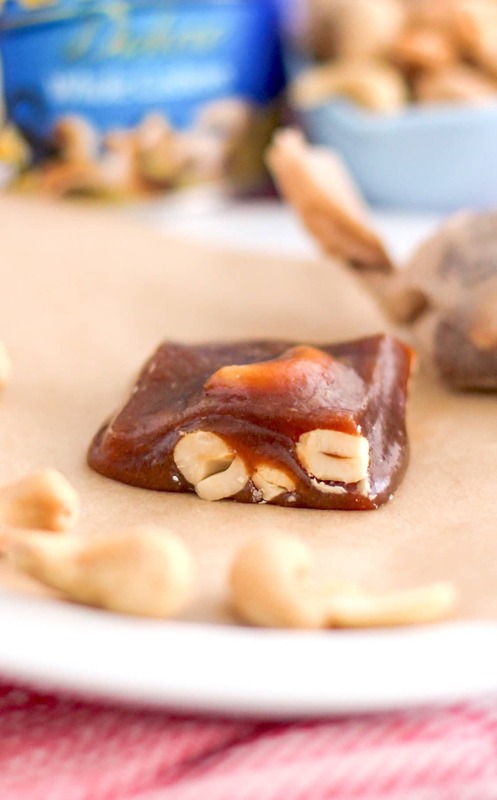 These Chewy Cashew Caramels are salty and sweet, soft and chewy with a slight crunch in every ultimately satisfying bite. When they’re wrapped individually, they’re perfect for the holidays and gift-giving. This Chewy Cashew Caramel right here? Literally MADE for me. 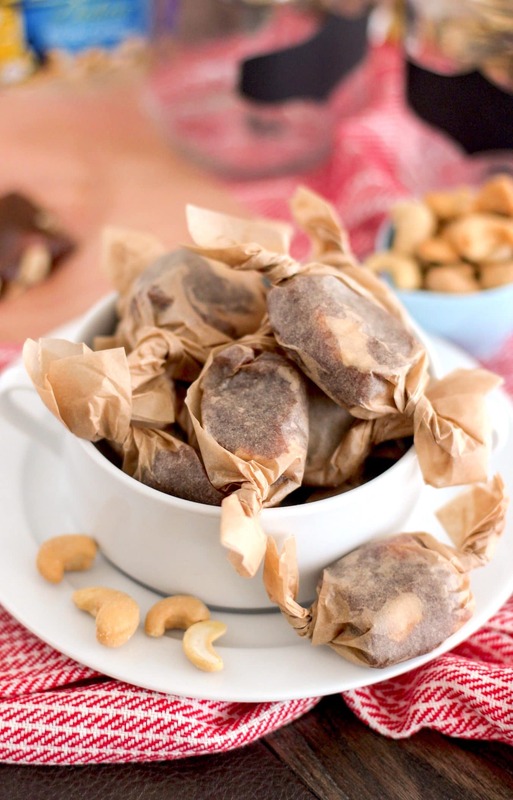 Secretly Healthy Decadent Chewy Cashew Caramels made without the heavy cream, butter, white sugar and corn syrup! Refined sugar free, dairy free, vegan. Generously spray an 8x5" loaf pan with cooking spray and line one way with parchment paper. 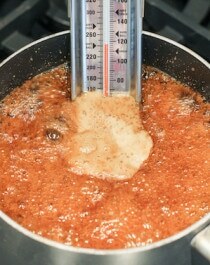 In a 3-quart saucepan, add the maple syrup, water, sucanat and erythritol. Do not stir. 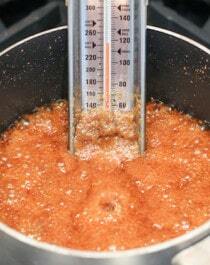 Add a candy thermometer to the saucepan, then place the pan over a stove set to medium-high heat. Very carefully, add the vanilla extract. It will bubble up vigorously, so watch out! Briefly stir in the cashews, then pour the caramel into the prepared pan. Let cool at room temperature for 3 hours. 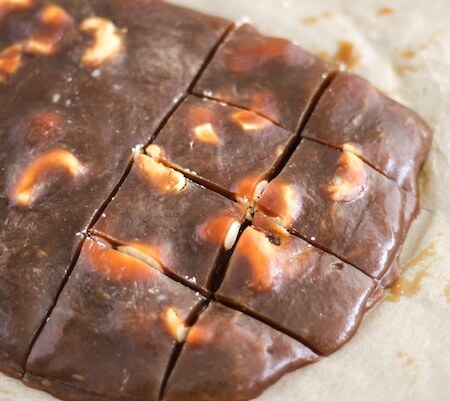 Transfer the caramel out of the pan and flip over onto the parchment-lined cookie sheet. 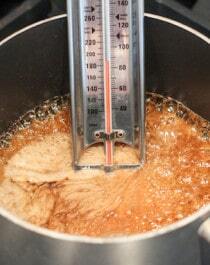 Peel the parchment paper off the top of the caramel and refrigerate uncovered for 2 hours (or overnight). Cut the caramels with a sharp knife (I cut them into 32 pieces -- 8 rows x 4 columns). Wrap the caramels in parchment paper cut into 4" squares. 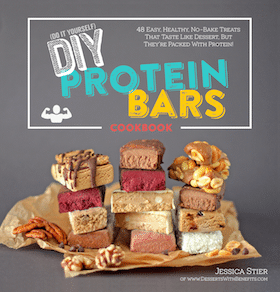 Serve immediately, or store in a tightly sealed container in the fridge for up to 2 weeks. 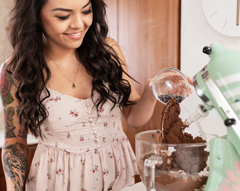 *I wouldn't recommend substituting the sweeteners used in the recipe. You may be able to use more sucanat instead of the erythritol, but I haven't tried it. All I know is that coconut sugar will not work in place of the sucanat (you will get caramel sauce... delicious, still, but it won't firm up)! This sounds absolutely scrumptious! ! Will be trying very soon. Would a sugar free maple syrup work? Or do you need the naturally occurring sugars to crystallize? Thank you Jessica! I’ve actually been experimenting with Lakanto, it’s a monk fruit blend that’s been bound with non GMO erythitol, has a subtle molasses flavor and a darker color, I’ll try that in place of the sucanat and tell you what comes of it! After the first bite, I was sure you accidentally made them with dairy. After eating the whole thing, I was still sure. A few weeks later, I am still stunned. Best. Vegan. Caramels. Ever. And I’ve tried just about every recipe there is out there. Love you, and way to be Jess! You are amazing! Umm this was made for me!